Cycling has to be one of the greatest sports. Not only will you get fit and healthy, but you’ll experience an ever-changing array of sights, smells and sounds whilst doing so – great for the body and mind. And any sport that encourages men to wear lycra pants has to be good. Thailand offers great cycling, as I discovered on my recent trip to Hua Hin. Hua Hin, 250km south of Bangkok and easily reachable by car (direct luxury bus from the airport) boasts beautiful beaches and spectacular scenery. 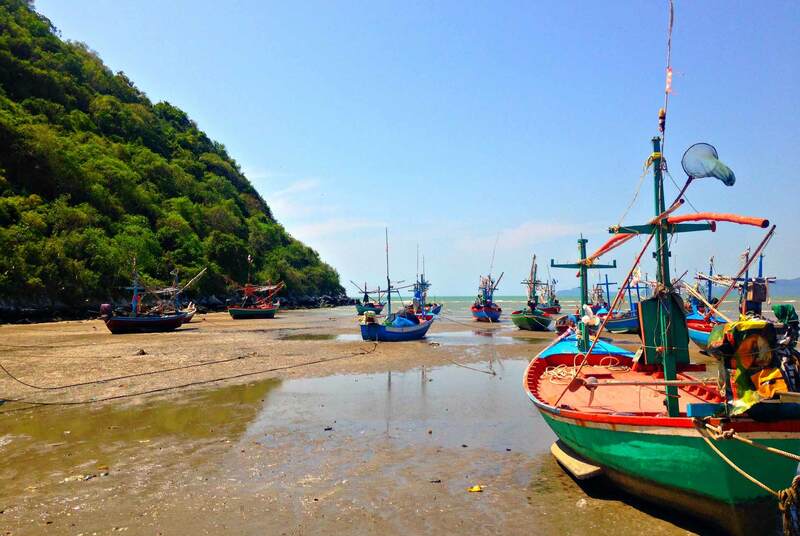 It attracts fewer tourists than the south of Thailand, ensuring it remains peaceful, friendly and unspoilt. We were collected by Hua Hin Bike Tours from our hotel around 8am and immediately set off for a small village south of Hua Hin, joined by our Thai guide Yo and the burly, jolly and talkative company owner, Chris. The bike tour started at Dolphin Bay with white sand beaches and stunning islands facing us and craggy mountains behind. The roads were flat and empty, allowing us to relax and enjoy the beautiful scenery. While we rode, Chris explained to me that he first became interested in cycling when he participated in the HIV/AIDS charity ride in USA. He was lucky enough to participate in this ride on numerous occasions, raising huge sums for HIV/AIDS services and research. After moving to Thailand, he decided he’d like to raise funds for Thai charities and launched the Tour De Thailand, a ride which traverses the entire country, from Chiang Mai in the north to Phuket in the south. Chris covered the 2,400km distance himself for the inaugural ride. 10 years on and the event attracts enthusiastic cycling fundraisers from all over the world contributing to a great cause, Operation Smile (cleft palate surgery for children). Chris is a truly inspirational guy with a big heart. Following the quiet coast roads, the scenery was stunning as we stopped at pretty viewpoints for drinks and fresh fruit (including Thailand’s best pineapple which is grown in this region. Yum!). A couple of hours into the ride we stopped for a short hike up a nature trail – Chris had us clambering over rocks and through caves before arriving at a rocky platform with a beautiful view of the coastline. Not far on and we stopped for my favorite part of the day, a hearty lunch of delicious Thai food. Of particular note was the crab curry – delicious! Soon after we experienced one of the nasal highlights of the day as we rode past thousands of squid drying in the sun…intense! We continued the ride along the coast before passing through a small fishing village on our way to a mangrove rehabilitation project, where we took an interesting tour through the mangrove ecosystem, complete with scarily large monitor lizards, mud skippers and storks. The tour was scheduled to end soon after however the company is quite flexible and willing to continue for those feeling strong. We chose to press on – had we known about the hills that were coming up or the 40 minutes of heavy rain then perhaps we wouldn’t have been so keen. Regardless we soldiered on (riding in the rain was quite refreshing), ending up at the army base where the annual elephant polo tournament was being held (see our recent blog). Men in uniforms, elephants playing polo and a glass of wine – what a great way to finish a great day! If you’re interested in taking a bicycle trip while in Thailand, look no further than Hua Hin Bike Tours (they also offer a great trip riding from Myanmar to the coast of Thailand). The bicycles are in great condition, safe routes are chosen and the food and company are excellent. Or for the more adventurous and altruistic, join the Tour De Thailand trip (or alternatively make a donation to the cause – Chris has undertaken to complete 9,000 push-ups, ride 6,000km and lose 10kg in 3 months to inspire you to help). Hua Hin Bike Tours is very LGBT friendly – Chris even proudly informed me that he is a gay lover (I later found out his wife’s name is Gaye).